As the holiday season bears down on us like the coming polar vortex we once knew as winter, adults and kids alike are getting into the holiday spirit. This time of year is often spent with family, friends and the kitchen. No matter how you choose to celebrate the holiday season most of it will somehow see us in the kitchen. The coming holiday season is a great distraction for us as we enter the darkest days of the year as our annual sojourn about the sun which is often filled with excess, expectations, and exchange. My 2 youngest children and I have baked the following recipe a few dozen times with great success which she named after us while the second recipe is a classic standby often enjoyed by many. The following cookie recipes contain nuts, eggs, dairy, and gluten so be cautious not to send these cookies off to school or to those around you with comparable dietary concerns. Method: In a stand mixer or in a large bowl using an electric mixer cream together the butter and sugar. Add the egg and vanilla to the butter mixture and beat again until smooth. In a separate bowl combine all of the dry ingredients together and mix until evenly incorporated. Add the dry ingredients to the butter mixture and gently combine the two at low speed until they are evenly mixed together but do not over mix. Form the dough into 1 inch balls and place them evenly spaced onto a parchment lined baking sheet. Bake the soon to be cookies in a preheated oven at 350f for about 10 minutes, or until golden brown around edges, but still soft in middle. Store in an air-tight container for up to five days or sealed in sealable freezer bags for up to 3 weeks. In a stand mixer or in a large bowl using an electric mixer beat together, peanut butter, butter, vanilla extract and powdered sugar until it pulls away from the side of the bowl and becomes crumbly. Using your hands take about a teaspoon size amount of dough and roll into a ball, place the ball onto a parchment lined cookie sheet. Repeat this process until no dough remains. Place a toothpick into each ball and place in the freezer for 30 minutes. Melt the chocolate in a stainless steel bowl placed over a saucepan of simmering water. Using the toothpick to pick up the dough balls, dip the balls 3/4’s of the way, one at a time, in the melted chocolate. You want to leave a little bit of the peanut butter showing on top so that they resemble a chestnut. 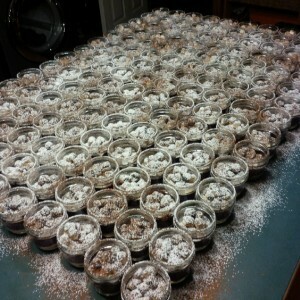 Remove excess chocolate. Place back onto parchment lined cookie sheet. Remove the toothpick and refrigerate until firm. Store in an airtight container in the refrigerator for up to five days or sealed in the freezer for up to 3 weeks. Many people simplify their holiday baking by taking part in a cookie exchange. 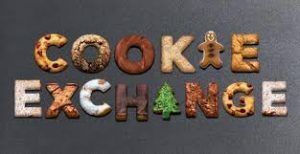 To the uninitiated the cookie exchange concept is a relatively simple gathering of friends and family who have each baked one kind of cookie in a large enough quantity to divide out a dozen of their cookies to each person in attendance allowing everyone to leave with several dozen different cookies. 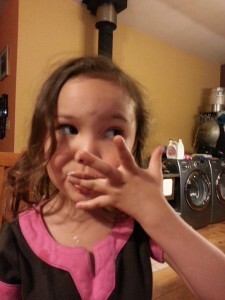 Rasi says you know they are good when they are sticky! These curious social engagements show how cookie baking has evolved from something of a sweetened biscuit to an artisanal craft. This evolution has impacted the culture of the cookie bakers as we can witness those who bake in collaborative groups sharing ideas, cookies and recipes to those who bake in private having all of their Holiday baking done before anyone arrives sharing cookies and time with guests, and there are those who bake a variety of cookies and share only specific cookies with certain guests, in a spendthrift way. Regardless the baking of great cookies has been symbolic of ones prowess as in the domestic kitchen. Generations of immigrants from all over Europe have contributed to the Canadian tradition of baking and eating cookies. The holiday season sees the popularity of this tradition rise up like a soufflé with many people baking cookies, and a far greater number of people eating them. The challenges of baking cookies and holiday treats to accommodate everyone’s needs, preferences, allergies and intolerances can either make one rise to the challenge or simply walk away from the kitchen altogether. One of my favourite holiday treats is the Buckeye which can be prepared to accommodate most dietary restrictions. Traditionally the Buckeye is made using peanut butter which can readily be substituted with soy based WOWBUTTER produced here in Ontario. WOWBUTTER is made in a dedicated 100% Peanut Free, Tree Nut Free, Gluten Free, Dairy Free and Egg Free Facility and is Vegan, NON-GMO, Safe-for-School, and Kosher/Halal approved. In a large bowl, beat together, peanut butter, butter, vanilla extract and powdered sugar until it pulls away from the side of the bowl and becomes crumbly and set aside. Take a teaspoon size amount of dough and between your hands roll it into a ball, place the ball onto the parchment lined cookie sheet. Repeat this process until you have rolled all of the dough into balls. Insert a toothpick about half way into each ball and place the tray in the freezer for 40 minutes. While the dough balls set in the freezer melt the chocolate in a stainless steel or tempered glass bowl over a saucepan of simmering water. Remove the chocolate from heat and stir it until smooth. Using the toothpick dip the balls 3/4’s of the way, one at a time, in the melted chocolate. You want to leave a little bit of the peanut butter showing on top to make the buckeye look. Remove any excess chocolate and place the buckeye back onto parchment lined cookie sheet. Remove the toothpicks and smooth over the holes. Store the Buckeyes in the refrigerator until ready to serve. Shortbread, Thumbprint, Buckeyes, Bark. Gingerbread, Snickerdoodles, and Lebkuchen where does one start? This past week’s sudden arrival of wintery weather combined with the month of December being only a week away has suddenly thrusted us into the holiday season and all associated festivities. As our annual sojourn about the sun sees us enter the darkest days of the year we will distract ourselves with excess, expectations, and exchange. No matter how you choose to celebrate the holiday season most of it will see us spending much of it in the kitchen. As we count down the days, many of us are trying to get ahead on our holiday baking which is a monumental achievement unto itself. 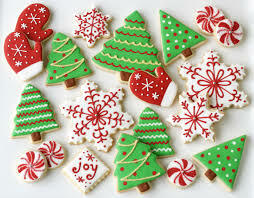 Some choose to simplify their holiday baking by signing up for cookie exchanges which sometimes can compound stress as these occasions can have an underlying passive-aggressive competitiveness to them and are further compounded by accommodating the numerous dietary concerns of gluten, nuts, sugars, fats and vegetarians which can easily eliminate many people from your Christmas list. Finding recipes that are able to accommodate everyone that still have flavour and a desirable texture is not easy to do. 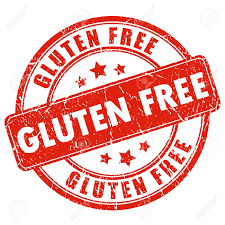 We are not only accustomed to but we are somewhat hardwired to consuming fats, sugars, salts and gluten as these ingredients not only create desired flavours but also anticipated mouth feel which are often difficult to replicate in a manner that has an appreciatively palatable. My oldest daughter has a collection of recipes, mostly desserts as she has a fondness for sweets. She recently took one of the recipes out to bake. I glanced at it the paper which had the boldly written title “Black Bean Brownies”. I immediately had thoughts that were something like “oh barf” but I kept my mouth shut until they were baked and she proudly handed me one of her Black Bean Brownies, which as a father I was obliged to try, and as a chef was having a culinary conniption. Well as the story goes I was pleasantly surprised and have included the recipe in this week’s column as it is share worthy. I have made a couple of minor adjustments to it like using maple syrup instead of honey so that it is vegan friendly as well as scaled back on some of the ingredients to suit my own palate. It is also notable that other than the chocolate and vanilla all of the ingredients can be sourced from Ontario producers. Combine all of the ingredients except for the chocolate chips in a food processor. Process the ingredients by pulsing them until smooth, scraping down the sides of the bowl every so often. Using a spoon, stir the chocolate chips into the mixture. Grease an 8×8 pan and pour the bean-brownie mixture into it. Bake the brownies in a pre-heated oven at 350°f for 20-25 minutes, until a toothpick inserted comes out clean. Let the brownies cool for at least an hour before cutting into squares. If the brownie still seems too soft to cut, let it sit in the refrigerator for an hour or 2 and let them firm up. Cut into squares and serve. Posted on Thursday, November 24th, 2016 at 9:08 pm	and is filed under Recipes.